This was a bit of a last-minute idea to use up the lemon curd from Sunday's meringue tartlets. I think it works pretty well! So here we have - plum and lemon tart. Pour your lemon curd into the freshly baked (cool) tart case, and spread evenly over the base. Careful not to overfill. 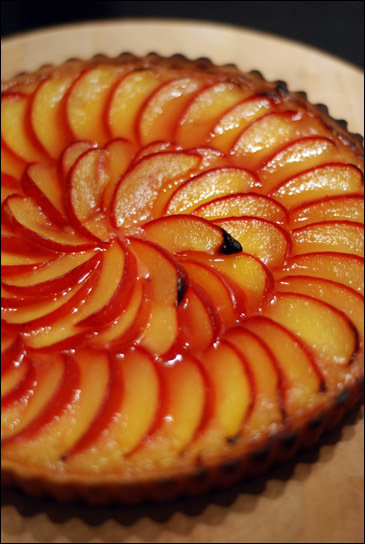 Next, lay the plum slices around the tart. I started from the outside working in, going around in a circular motion and overlapping them slightly. Finally, brush a little lemon juice onto the plum slices to prevent browning and then sprinkle with a couple of dessertspoons of muscovado sugar. Bake in the oven at 200° C for 15-20 mins and allow to cool before serving. If I were to do it again, I'd probably use orange rather than lemon curd (same recipe, but subsitute the lemons for oranges), and I'd definitely make my own pastry. Not even Waitrose is a patch on the homemade variety.